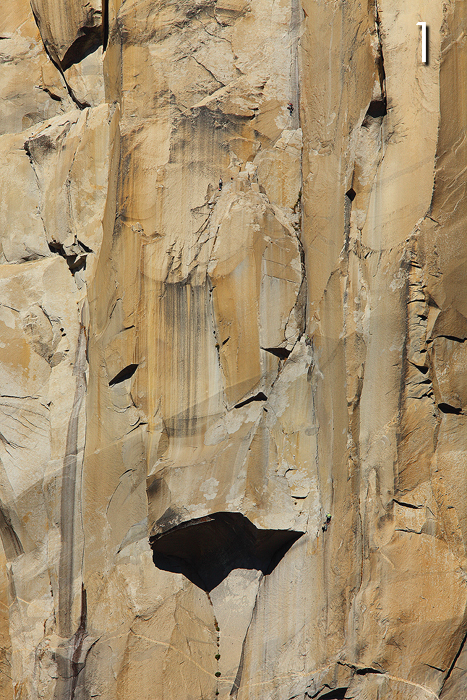 I don't think there are enough words, and surely no photo can capture the enormity that is El Capitan. The worlds largest granite monolith rises vertically to almost 3,000 feet above the Yosemite Valley. There's almost no part of the valley that isn't overwhelming in its beauty and sheer size, yet I always find my eye wandering back to El Cap. I am completely mesmerized by this rock. During this trip to Yosemite, I would spend the mid-day hours laying in the meadow below the monarch, watching climbers slowly make their ascent up the sheer cliff. I wondered what the view must be like, clinging to a smooth rock wall with nothing below or above you, but air, completely exposed. With a decent pair of binoculars it's fairly easy to make out individual climbers, and observe their tedius progress. Even at such a close physical range though, it becomes apparent that life on the wall is a completely different world from my peaceful vantage point below. During my days spent in the meadow, I would tinker around with different compositions looking for a decent angle to shoot El Capitan. It's a difficult subject to photograph due to size and lack of any sense of scale. My last day in the meadow these beautiful clouds rolled over the valley, completing the scene I was hoping for, and I got an image I was pleased with. One of the most interesting things I observed while laying in the meadow were the people who parked their cars and walked out, curious as to what everyone was looking up at. It always took them such a long time to spot the climbers. Even in person, the scale of the valley is hard to grasp. When first attempting to spot a person on a 3,000 foot wall, you will almost certainly make the mistake of searching for something far too large. When someone would finally spot a climber, their gasps, oohs and ahhs, were a testament to the almost incomprehensible view. This experience got me thinking about photography, and specifically scale. So, while I burned the daylight hours in the meadow, waiting to depart somewhere for sunset, I decided to take a few different photos with my super telephoto lens that I could later combine in a series of photos that might make for an interesting series. Hopefully giving the viewer a slightly better idea of the scale of this place. Obviously, this is no replacement for the real thing, but it's worth taking a look at. At least I think so! El Capitan...The view from the meadow, as cirrocumulus clouds move across the sky. 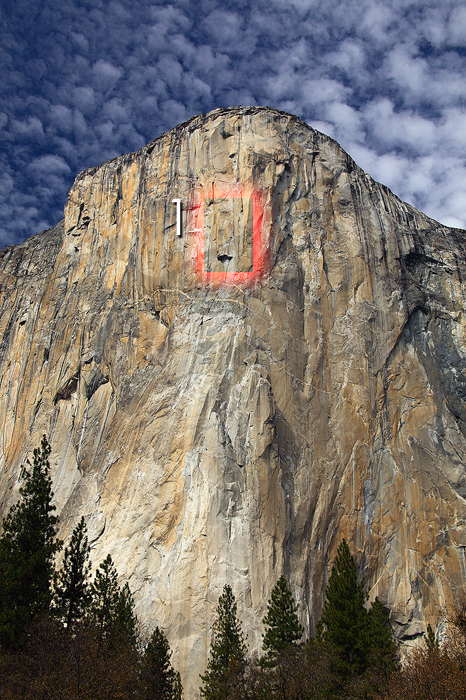 Climbers will spend multiple nights on the wall. Typically experienced climbers will make the ascent in 3-5 days. With the help of a super telephoto lens I decided to focus on a single part of El Cap. (outlined in red) I believe this part of the wall is called "the great roof". The overhang creates a shadow that is visible in this photo. Now, the area outlined in red in the photo above is multiplied many times over. 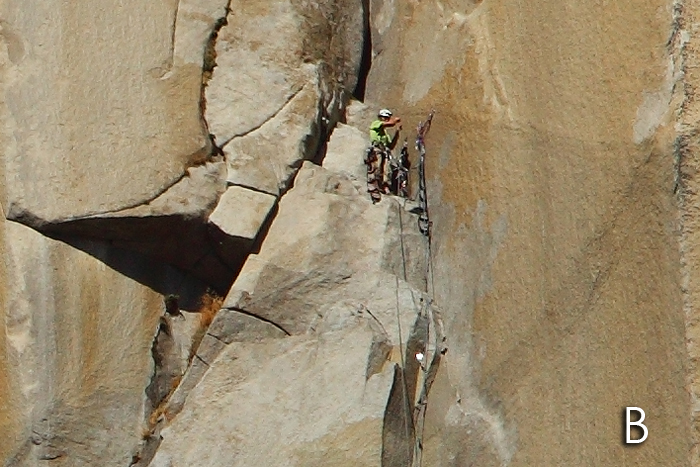 At this point, it would appear that we have a good close up of the granite face of El Capitan. Look closer though. Can you spot the climbers and their gear? If you can, you're probably realizing this close up shot isn't as close as you thought. If you can't spot them, I've highlighted the areas in the photo below. 3 climbers, working their way up a small crack are barely visible. 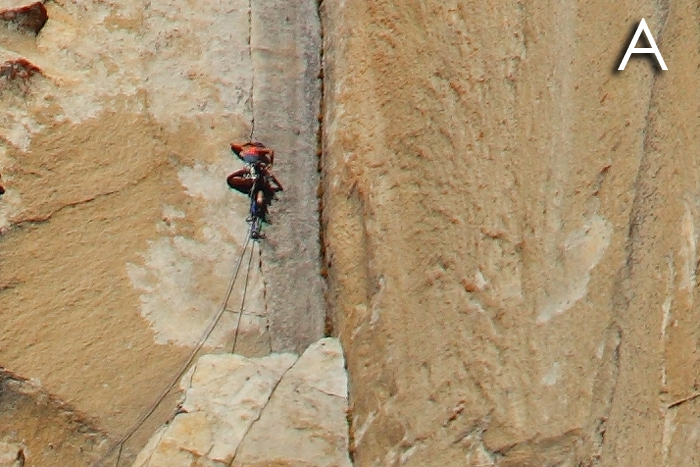 Finally, after multiplying the original image many many times, you can start to grasp the size of El Capitan. 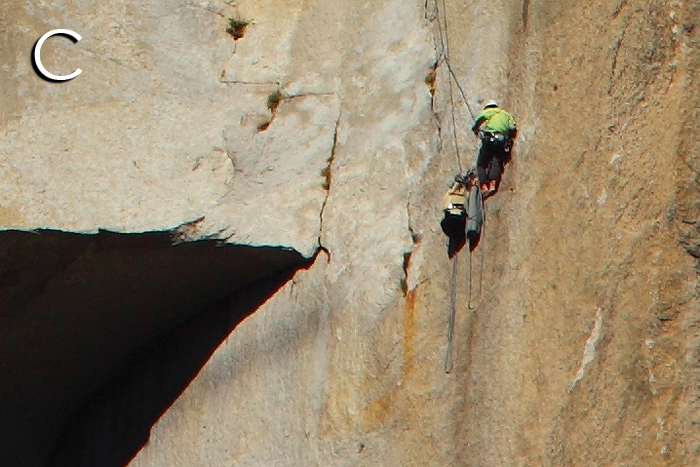 Now that you've seen a close up of these climbers, it's worth scrolling back up to the original image from the valley floor for comparison.